It is an art installation and it is a busking routine. Slow dancing with strangers is about barreling through social anxiety and language barriers and learning communicate through body language. It is about embrace. It is about vulnerability and intimacy. It is about being comfortable with being uncomfortable. It is about slowing down, making time for one another, taking time to interact and conducting those interactions with your heart as opposed to your conscious brain, which can become at times cloudy and overwhelming. It is about mechanics, physics, stories and conversations. It is a way of making mundane experiences entertaining and making the present moment a priority. It is about spreading optimism and acceptance. It’s about connecting. 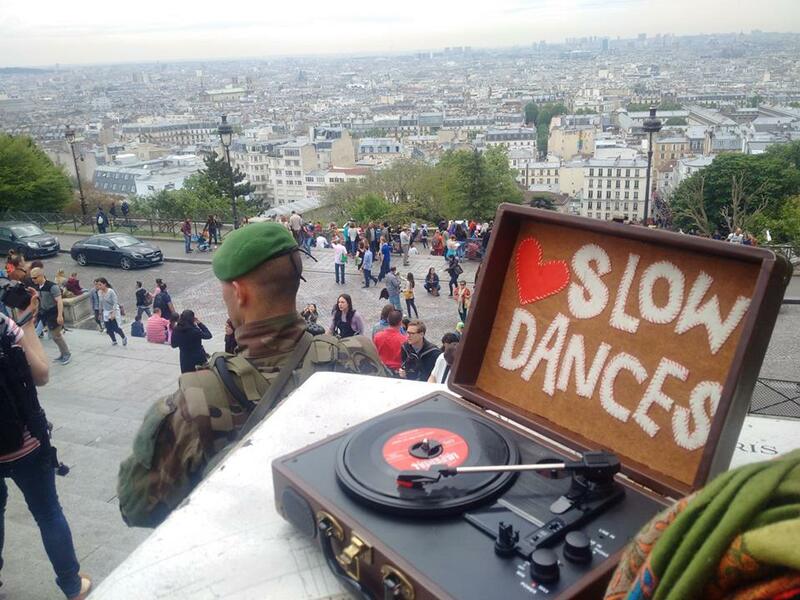 I travel with around the world with a suitcase record player and a box of 45s and try to convince strangers in the street to dance with me. These are my stories.